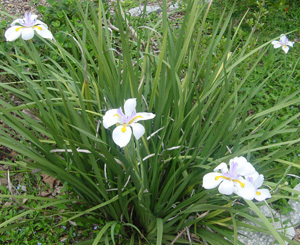 African Iris (Dietes vegeta) is also known as Butterfly Iris. This grass like plant grows in a tight clump of long narrow sword like leaves. It blooms best in full sun in fertile, well drained soil. It is not salt tolerant. Propagation is by division or by seed from the large seed pods that form. The clumps are made from muliple fans that grow to approximately three feet in height. It does well in a wet area where the leaves can grow to as much as six feet. The flowers are white with yellow or brown spots on the petals. This is a hardy plant than can easily be substituted for the look of ornamental grass.